The most essential part of wedding preparations is to decide about the design of the wedding invitation card. 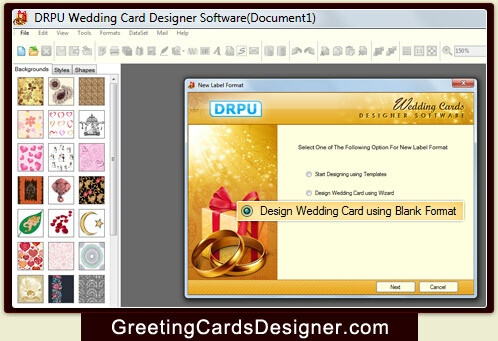 Now you can easily design your own wedding card by yourself with this wedding card designer software. Easy to use wedding card maker program proficiently makes beautiful wedding cards for marriage occasion. Wedding card making program allows you to add Backgrounds, Styles, Shapes and Wedding Templates on the card to make designer wedding cards for your dream day. Wedding card creator program provides facility to send designed wedding invitation via email with inbuilt email settings. Creates beautiful wedding cards in different shapes such as rectangle, ellipse, rounded rectangle and CD/DVD shapes. 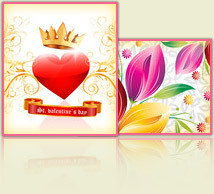 Designs Wedding Cards using different image designing Tools including Text, ClipArts, Signature, Wordart, Barcode, Shape Type and Insert Image. Provides facility insert image from library during Wedding card designing process. Allows you to design multiple numbers of wedding invitation cards to send different people. Provides inbuilt printing settings to print designed wedding invitation cards. Empowers you to select the different color and background on the card. Provides inbuilt email settings to send designed wedding card through e-mail.